The United States returns to peace time production. 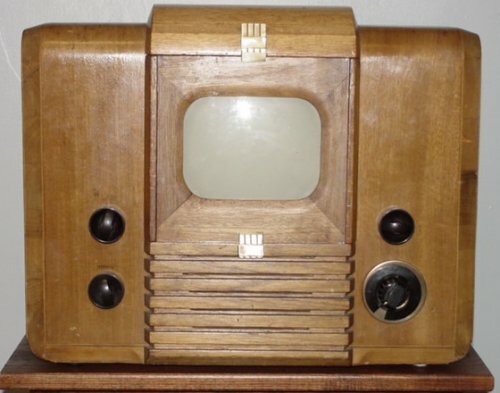 RCA begins production of 630-TS, the first television designed and manufactured after the war. Approximately 10,000 units sold by the end of the year, with about 43,000 sold of this model before production ends in 1949. Other manufacturers used the RCA chassis, and placed it in a cabinet of their own design. The initial RCA selling price was $352. One of television's critics, Darryl F. Zanuck, head of 20th Century Fox (movies) was quoted saying: "Television won't be able to hold on to any market it captures after the first six months. People will soon get tired of staring at a plywood box every night." May 9th -- Hourglass the first hour-long musical variety show, airs over NBC's three stations (New York City, Schenectady and Philadelphia). England resumes TV broadcasting on June 7, 1946. June 19th -- The first televised heavyweight fight (Joe Louis vs Billy Conn), viewed by a record 140,000 (mostly at bars which had sets installed). One year later, the Louis-Walcott fight is viewed by 1,000,000 people. October 2nd -- Faraway Hills becomes the first TV soap opera, airing on the new DuMont network.